A powerful "antidepressant" for your skin, removing the affects of daily attacks from stress and tiredness. It will multiply the benefits of our products thanks to the synergy of Nature Effiscience products. Created for combination, normal and dry skin, even for the most sensitive skin. To use on a daily basis on your face, alone or before moisturizing, day and / or night. Clear gel, rich in active ingredients. Its fragrance evokes a floral bouquet which disappears after the application. Use the serum daily on your face, neck and neckline, on clean and dry skin, using light circular movements (see instructions below), alone or as a base for other moisturizing face care products. Normal to combination skin: just one daily application of the booster EFFECT®, applied alone or before other products, moisturizes and oxygenates your skin for a long time. Normal to dry skin: use the booster EFFECT® serum day and night, preferably before a face care product, for moisturized, stress-free and pollution-free skin. Replenishing and brightening actions: use the booster EFFECT® serum with the hydrate EFFECT® product for an intense moisturizing effect. Thanks to the hyaluronic acid and the strawberry plant extract, your skin is oxygenated and more radiant. Anti-wrinkle action: use the booster EFFECT® serum with the lift EFFECT® product for deep anti-wrinkle action. Thanks to the combination of the hyaluronic acid and an exclusive butterfly lavender complex, wrinkles are visibly minimized, your skin is repulped, smoother and your complexion is more even, supple and bright. Remedial action: use the booster EFFECT® serum with the mask EFFECT® product to obtain anti-aging and healing results. Thanks to the hyaluronic acid and the zinc oxide, your epidermis heals better and your complexion is radiant. Apply daily in light strokes alone or before your morning and/or night cream, smoothing over the forehead in an arc movement, over the cheeks in circular movements and upwards along the contours of the face. Press 3 times in the center on Point 1, between the eyebrows. Press 3 times on Points 2 at the top of the cheekbones, as shown in the diagram. Skin is instantly plumped up and feels more comfortable, for a result that lasts throughout the day. Your features appear rested and your complexion radiant. booster EFFECT® reactivates 3 vital skin functions: hydration, oxygenation and protection. Day after day, your skin is plumper with a more radiant, toned, even complexion.. The Guava and Chlorella extracts combined with Hyaluronic Acid hydrate skin instantly with a lasting effect that simply gets better with time, since the skin’s moisture levels increase day by day with regular use. A few seconds after applying the serum to your face, you will feel your skin become slightly smoother, erasing signs of fatigue. You look radiant! Skin is hydrated, more even and fine lines fade. Skin hydration progressively increases, with a lasting effect. Fine lines fade with the action of the Hyaluronic Acid, which captures and retains large volumes of moisture, combined with Everlasting extract, which stimulates the release of ß-endorphin, better known under the name of the pleasure hormone. Skin becomes less stressed day by day and its moisture levels increase. 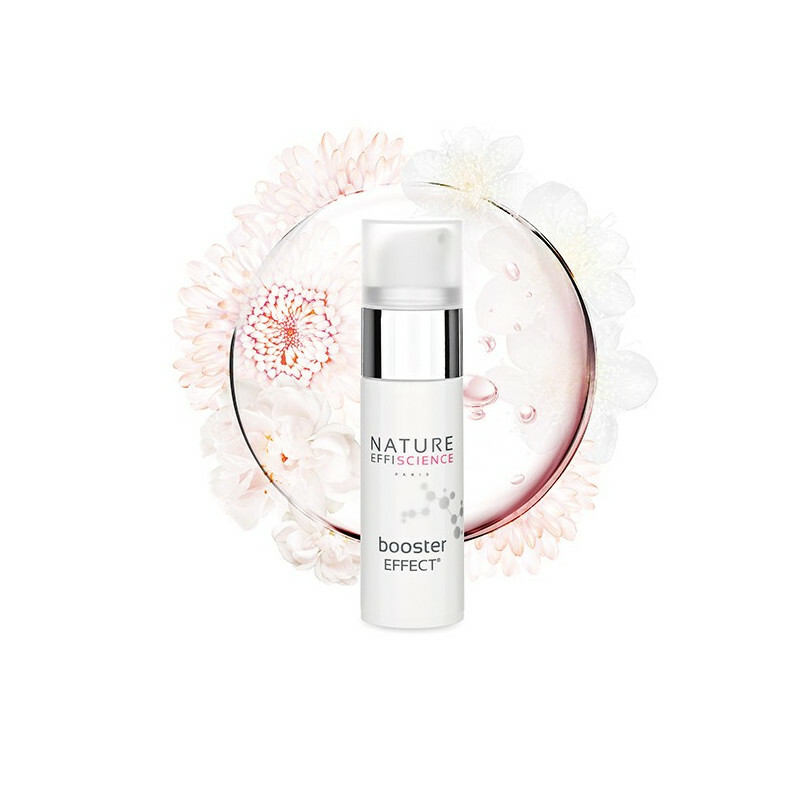 booster EFFECT® has an anti-wrinkle and complexion-evening action. This multi-faceted moisturizing serum prepares your skin before applying your additional treatments, the effects of which are increased and accelerated by the synergistic action of Nature Effiscience’s exclusive formulations. Its formula is 99% active. This treatment has been tested under dermatological control with no visible cutaneous reactions being reported on the skin of voluntary testers. The booster EFFECT® formula contains no Parabens or Phthalates, no Mineral Oils, no Monoethanolamine, no Diethanolamine, no Triethanolamine, no silicone and no ingredients of animal origin. 91% of the entire formula is organically grown, which is 9 times more than the percentage demanded by the ECOCERT standard required for organic certification. It is an ethical product; neither the formula ingredients nor the product itself are tested on animals. The bottle and packaging are recyclable.